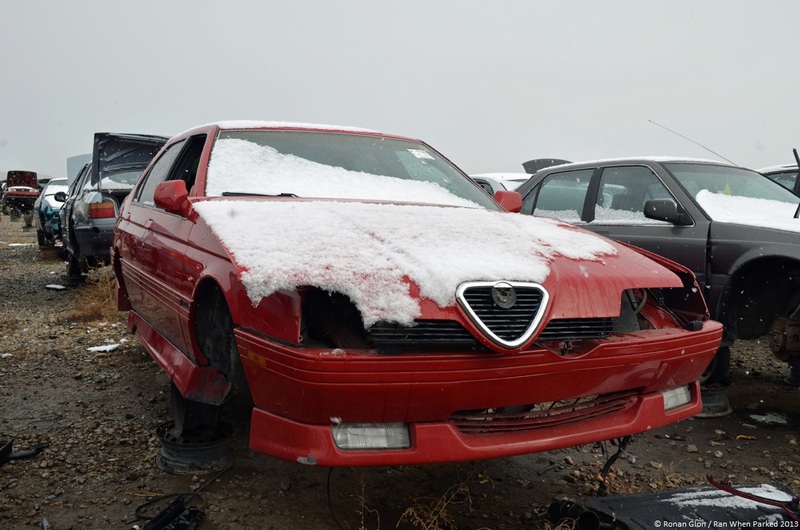 We were surprised to find an Alfa Romeo 164 S in a self-service junkyard located in northern Utah. Although the 164 is not the most sought-after Alfa ever produced, it remains an uncommon car that is almost always driven by an Alfisti who will either fix it or pass it on to another enthusiast when it dies rather than simply junk it. We were even more surprised when we popped the trunk and realized it was full of service records and parts catalogs from well-known vendors that specialize in Italian cars. A quick look through them revealed the car was regularly serviced at the local Ferrari dealership, which is arguably the least efficient way to keep an Alfa Romeo, Lancia or Fiat on the road, especially considering there is an excellent, factory-trained independent Italian car mechanic just around the corner from the dealership. The previous owner evidently spared no expense in keeping his 164 in tip-top shape. One of the last major records we found was a $1,600 service to fix the A/C and several hydraulic components carried out in September of 2009 when the car had 102,000 miles (160,000 kilometers). We took the photos below last month and the odometer read approximately 122,000 miles (196,000 kilometers), indicating the car was used as an occasional driver at best in the last few years of its life. The 164 was relatively rust-free, which is not surprising considering 164s were noticeably better rust-proofed than older Alfa sedans like the 75 / Milano and the Alfetta. The 3.0-liter V6 engine and the five-speed manual transmission were gone and miscellaneous bits and pieces such as interior trim and all emblems were missing, but the car was relatively complete even after spending three or four weeks on the lot. I saw this one too, a sad ending to a fine automobile. You should check out the Euro 450SEL 6.9 at Pick N Pull on 3300 S, that one really pains me to see it in the junkyard. I saw that and shot it a few weeks ago. There’s a neat Datsun B210 on the other end of the lot, too. Also, there’s a B GT at Tear a Part on Redwood. Bs are not entirely uncommon in junkyards but the GTs are much rarer. What a mystery. If it was in an accident or had terminal cancer I might understand — but the body looks to be in relatively good shape. I wonder why it was parted out. Maybe it was a cash for clunkers trade way back? Hard to imagine how or why such a pampered example got left for dead. Blown engine cost more to rebuild than worth of vehicle? I doubt it, I think all of the cash for clunkers cars are long gone.